ELECTRIC VEHICLES IN THE TOWN CENTRES. Orienteering is showing its typical environmental care, again. The vehicles for the transfers from parkings to competition centres will be emissions free. Bike Boutique, a Vicenza-based company, will supply two Birò electric vehicles for the downtown transfers. Birò vehicles will also parade during the opening ceremony next Monday. ORGANIZERS ON MOUNT PASUBIO. On a sunny day the organizing committee made the ascent of Mount Pasubio yesterday. 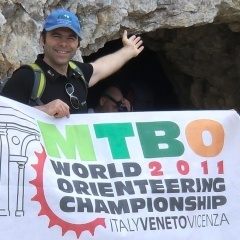 Wearing the official World Championships t-shirts and banner, a MTBO 2011 delegation walked through the well-known "Route of 52 Galleries", a military trail built during World War I on the massif of Pasubio. It came out a nice team building activity, just one week before the big event. BEPI SIMONI, FROM COURSES TO DATA PROCESSING. Another important member of the organizing committee is Giuseppe "Bepi" Simoni. Also President of the Trentino Orienteering Committee, Bepi has enormous experience as a sport leader, with two world championships (JWOC 2009 and ISF 2011) and many international competitions in his background. For MTBO 2011 Bepi is the courses supervisor and course setter of the Long distance qualification and Sprint final. He is also the leader of the data processing team, thanks to his great experience in the computer science field.